We just had a lemonade stand over here. It was lemontastic. To see more of our Lemonade Stand go HERE. On top of making two kinds of lemonade, we also made some lemony treats that they could sell as well. The most popular treat that we sold was the Lemonade Chex Mix. This is a super yummy and super easy treat to make. You owe to it to Summer to make yourself some. Pour cereal into a large bowl and then set aside. Melt the chocolate, butter, lemon zest, and lemon juice in a microwave safe container. Melt for minute. Stir. Melt for additional 30 second intervals until smooth when stirred. 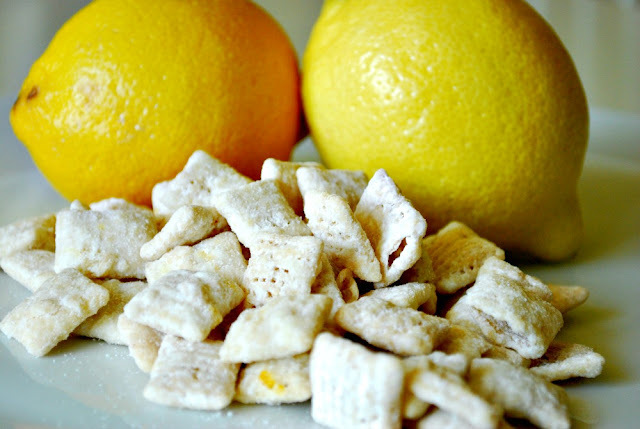 Pour melted mixture over cereal and gently stir until the cereal is evenly coated. Transfer the cereal into a gallon ziploc bag. Add the powdered sugar and shake, shake, shake your money maker. Serve it up. Hope your Summer is going splendidly. Thanks for reading! I've been soooo excited bout this recipe since you mentioned in the lemonade stand post! Thx for sharing. I'm off to get some white choc. chips & give it a whirl :) YUMMY! Um, this looks divine. I love anything lemon, and anything easy. Making it this weekend!